The colourful facades of the buildings in the old town district of Landshut, the capital city of Lower Bavaria, Germany are just one of the many reasons why the city is a popular destination for tourists especially those interested in architecture. Set against a vivid blue sky, these striking facades of buildings in the old town district of Landshut add diversity to the cobbled streets of this capital city of Lower Bavaria, Germany. Landshut has been a city of several architectural eras since it's founding in the year ca 1204. These buildings line the main street of the old town district. 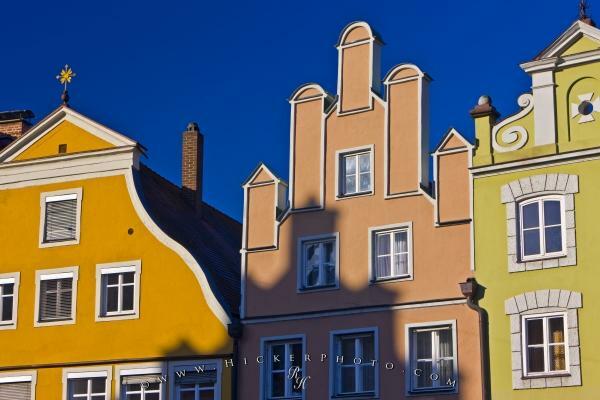 Colorful facades of buildings in the Old Town district in the City of Landshut, Bavaria, Germany, Europe. Photo of the facades of buildings in the old town district in the city of Landshut, Bavaria, Germany.